Johan Renck Brings 1960s French Sci-Fi Cool to Latest Ad for Perrier | The Eye of Faith Vintage 11.11.11. Something about this new ad for Perrier really brings me back in time. The french brand has impressed us before with a series of videos featuring legendary style icon Dita Von Teese taking us on a glamorously risque tour of her body and the elusively decadent Perrier Mansion. Entitled “The Drop“, this latest film continues on the blazing train of creative ingenuity, with this brilliant bend of 1960s French Sci-Fi aesthetic glory. The auteur helming the creative vision is Johan Renck, a director of Breaking Bad, and Walking Dead. We love the gold space suit and artful editing – it’s just a scorching hot day on Earth, and and only one woman who can cool us down…We also love the India Inspiration! The visuals immediately reminded us of Roman Copolla‘s 2001 film “CQ” that featured supermodel Angela Lindvall as Dragonfly in a fake French 1960s Sci-Fi film. The film was hardly a blimp on the radar, which is a shame, because it features some great design, a wicked soundtrack, and really fun and playful acting (especially Lindvall). 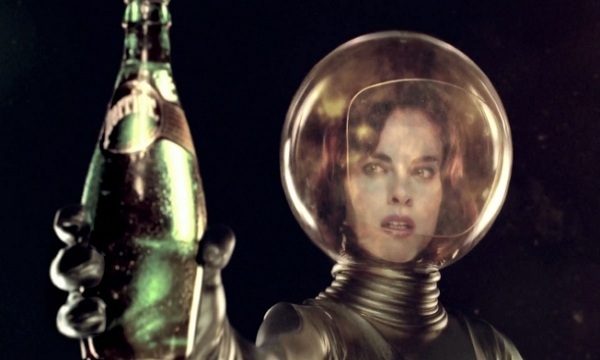 Perrier‘s latest campaign,”The Drop“, takes the 1960s sci-fi aesthetic to a whole new level, reinventing it for 2012, but staying clearly reminiscent. With an artist like Renck involved, it’s hard to go wrong. But it really is an artful eye that makes this such a captivating and clever little film.